Since finishing Koike and Kojima's Lone Wolf and Cub, I have hunted for its replacement. From Blade of the Immortal to Usagi Yojimbo, I have tried and failed to find a samurai series that captures something like the feeling of following Ogami Itto and young Daigoro on their tragic journey of vengeance. Since it involves samurai, is set in the same period, and was produced by the same creative team, Samurai Executioner was an obvious candidate. Samurai Executioner's protagonist is Yamada Asaemon. Like Itto of Lone Wolf and Cub, Asaemon is a ronin. Unlike Itto, Asaemon maintains a home and does not roam the countryside. He is a sword-tester, which in Samurai Executioner is a bloodier job than it sounds. Asaemon tests his swords on the bodies of convicted felons; sometimes he tests them on their corpses, and sometimes he makes them corpses. Samura Executioner, Vol. 3: The Hell Stick reprints 3 of Asaemon's stories. The title story, "The Hell Stick", is an example of something that I think is indicative of one of Koike's weaknesses. One of his favorite subjects is Edo period political intrigue, and I get the sense that after writing so many stories about samurai plotting against each other, Koike tries too hard to keep things fresh. The particulars of his characters' devious schemes can get ridiculously bizarre. "The Hell Stick" deals with a plot against a samurai involving a woman who he has cut as part of some kind of strange masochistic ritual. In "The Mad Sword of Tsukuba Bakushu" Asaemon duels a samurai after his job and in "Catcher Kasajiro" he counsels a shamed constable. 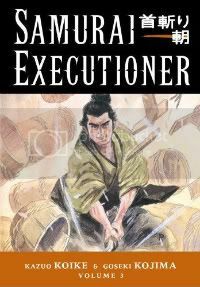 Unlike Lone Wolf and Cub, you would be hard-pressed to call Samurai Executioner an adventure book. Asaemon doesn't travel around Japan and he doesn't go on adventures. Particularly in this volume, people come to him - for help, for counsel, and sometimes to cause trouble. There's something about that that renders Asaemon less sympathetic. There's a reason why Luke is the hero of Star Wars rather than Yoda. When you have all the answers, you're no fun as a hero (also, to be fair, Luke is taller) and Asaemon certainly seems to teach more than he learns. This, I think, is a big part of the reason why Samurai Executioner's stories lack emotional power. Most of the drama revolves around the characters the reader has just met - the people approaching Asaemon with their problems - rather than the character the reader knows. It may seem unfair to judge Samurai Executioner by comparing it with Lone Wolf and Cub, but it's difficult not to. Not only did Koike and Kojima create both, but both deal with the same period of Japanese history, both were originally published around the same time, and Asaemon even facially looks like Itto's twin, right down to their bushy eyebrows. In fact, Asaemon came to his bloody end in the pages of Lone Wolf and Cub (his own series presumably finished by that point). When I spotted a group of children in the street on the second page of The Hell Stick, I couldn't help but wonder if Daigoro might be one of them and if Itto were in a lodging house nearby, tending his wounds from a recent contract. I will probably still collect every volume of Samurai Executioner. Kojima's art is just as much of a pleasure to behold, and Koike/Kojima made me a sucker for samurai comics with Lone Wolf and Cub.